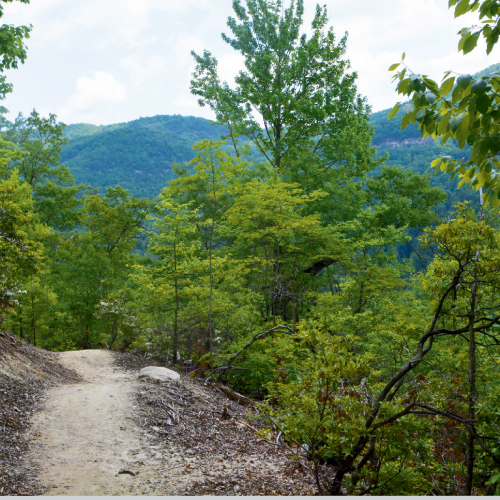 You can be among the first to blaze a new section of trail in Buffalo Creek Park that was recently unveiled by the town of Lake Lure. Trail builders plan to create a mountain biking mecca, but the initial loop of the proposed 10-mile system is also a worthy footpath. From the parking area, walk the wide gravel path for two-tenths of a mile on the banks of Buffalo Creek and enter the woods on a single-track trail on the right side of the path. In approximately a quarter of a mile, the trail forks and the loop begins. Clockwise, the loop zigzags like a tangle of ribbon up a mountainside. While the trail ascends steep terrain, the abundance of switchbacks allows hikers to steady their breath on a constant gentle grade. The path leads through a field of giant boulders to arrive at the capstone of the route. Explore the grooves and cracks of the richly textured stone under the shade of white oak, hickory, and pine trees. Beyond the rockfall, the trail soon crests a ridge with views due south to the northern tip of Lake Lure, and to the east, the craggy slopes of Youngs Mountain. Descend and complete the loop, retracing the gravel path to the parking area. Navigate: From Lake Lure, follow 64/74A east 6.4 miles. Turn left on Bill’s Creek Road, and travel 2 miles to another left on Buffalo Creek Road. In 2.3 miles, turn right at Rumbling Bald Resort and continue 1.7 miles to the park entrance on the left.